You can walk on a narrow path on the inside underneath the impressive ceiling. As a Houstonian visiting the Austin area, I was thoroughly impressed by Hamilton Pool. 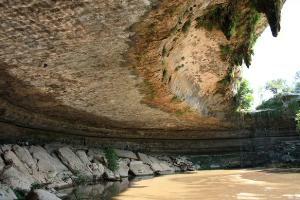 It is an amazing geological formation surrounded by beautiful trees and birds. It is like a little oasis in Texas. I arrived with a group after hiking Pace Bend Park earlier in the day, so I was pleased to find out that the steep $10/vehicle entrance fee we paid at Pace Bend admitted us to the Hamilton Pool for free since they are both part of the Travis County Park system. This isn't a hike, per se, as much as a place to visit and take photos, although there is a nice little nature walk down to the river. As impressive as photos of this place are, it does not compare to "being there" and experiencing the environment. The water in the pool was a murky brown when we went, but I suppose this is due to the fact that we arrived after a couple of days of rain and the bacteria count was high. One more thing -- pets are not allowed.